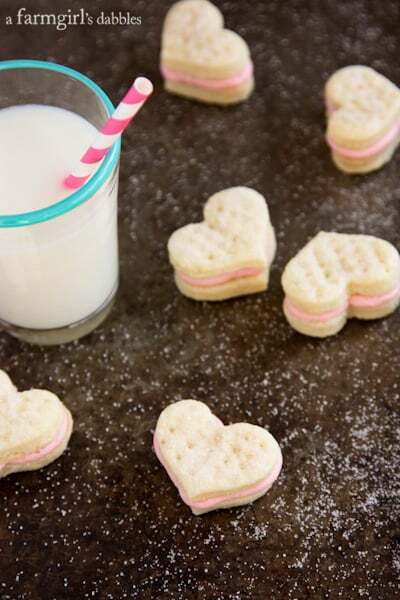 I adapted these Cream Wafer Sandwich Cookies with Strawberry Buttercream from a recipe that is a long-time Christmas tradition in our family. Between my mom and my aunt June, who both kept the sweets platters piled with little cream wafer sandwich cookies during the holidays, there was never a threat of running out of sweet buttery deliciousness. At Christmastime, the sandwich cookies are always in circular form, with a variety of colored icings. But with Valentine’s Day right around the corner, I knew I had to try out hearts. With pink frosting. They turned out so sweet! I’m ok with admitting that I ate a bit too much of this strawberry buttercream. Fresh and fluffy, still on the beater, its pretty pink strawberry looks and flavor proved absolutely irresistible. With cold glasses of milk, our daughters happily devoured a couple of these strawberry buttercream filled cookies, while telling me about their day at school. Then Blake, their non-fruity sweets lovin’ dad, came home and popped a couple into his mouth, too. He thought these cookies were extra good and said, “They just melt in your mouth”. Well, honey, that would be due to all the butter that’s packed into this recipe! I’ve always loved Valentine’s Day, for both the sentiment of love and for the treats. 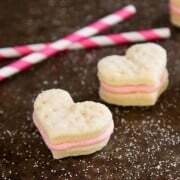 These little heart shaped cookies would make the sweetest gift, with two or three placed in a small bag, tied shut with a pale pink slippery satin ribbon. I know I’d love to receive them! In the bowl of a stand mixer, mix flour, butter, and whipping cream until combined. Cover and refrigerate for at least 2 hours. Preheat oven to 375°. Place about a 1/3 cup of sugar into a 9″ square pan and set aside. Take about one-third of the cookie dough out of the refrigerator, keeping remaining dough refrigerated. Roll dough to 3/16″ thickness on a floured surface. 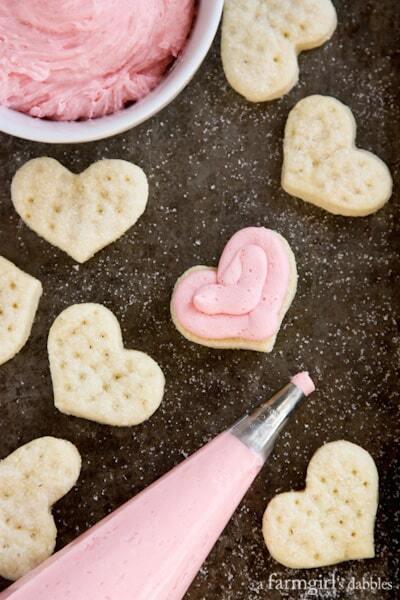 Use a small heart-shaped cookie cutter (mine is 2″ wide x 1-1/2″ high) to cut out heart shapes. You could also just use a small round cookie cutter, about 1-1/2″ to 2″ in diameter. You will want to work swiftly, as the dough softens quickly as it warms. With a thin metal spatula, transfer hearts to your prepared 9″ pan with sugar. Turn hearts over so that sugar adheres to each side. 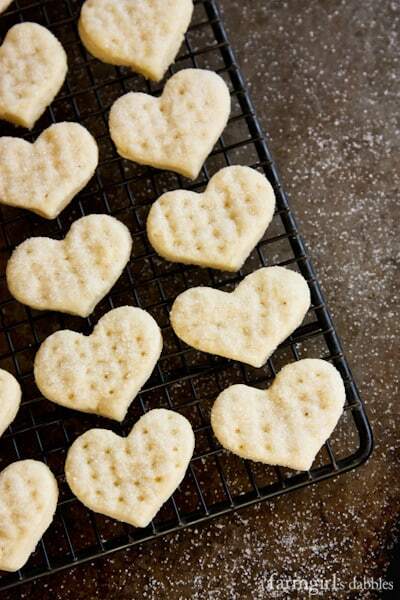 Place hearts on ungreased cookie sheet, about 1″ apart. Prick each heart several times with tines of a fork about 4 or 5 times. Sprinkle on a little additional sugar, if desired. Repeat with the rest of the dough, rerolling scraps as needed. After rerolling the dough more than once, the dough will start to lose its shape faster when rolled out and baked, so try to get as many cut-outs as possible out of each initial rolling. Bake 7 to 9 minutes, or just until set, but not browned. Let cool on wire rack or countertop. In the bowl of a stand mixer, beat butter until very smooth. Add powdered sugar and strawberry extract, and beat until smooth and fluffy, another minute or two. Tint with food coloring, if desired. Add strawberry buttercream to piping bag fitted with a medium plain tip. 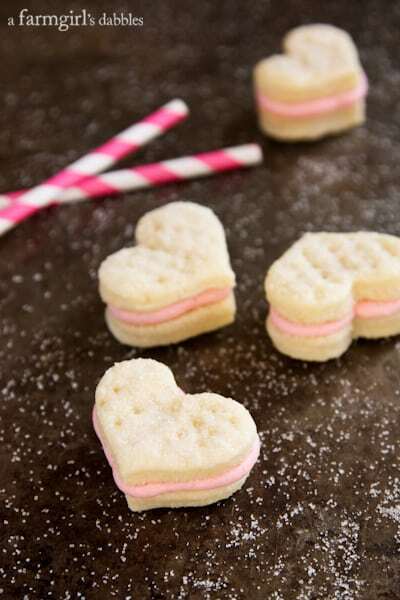 Pipe a single layer of buttercream onto the back side of one heart cookie (see photo in post). Top with another heart cookie and very gently press together. You could also use a small spoon to place the buttercream on the cookie, instead of using a piping bag, which will yield a much more casual looking sandwich cookie. Cookies store very well frozen in an airtight container, with layers of cookies separated by wax paper. Recipe adapted from Mom’s recipe box, originally from Betty Crocker. 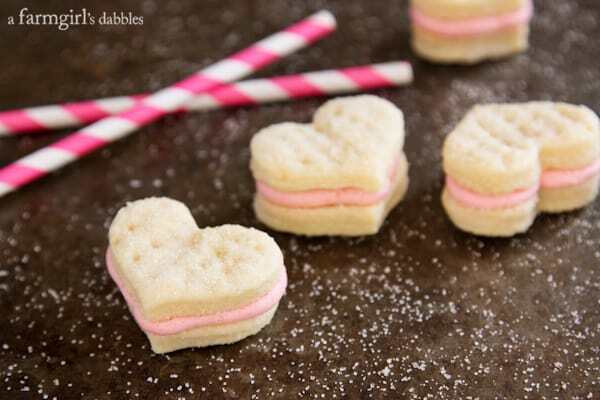 Looking for more homemade Valentine’s Day treats? !